This was the fourth book bearing the Elston Press imprint. 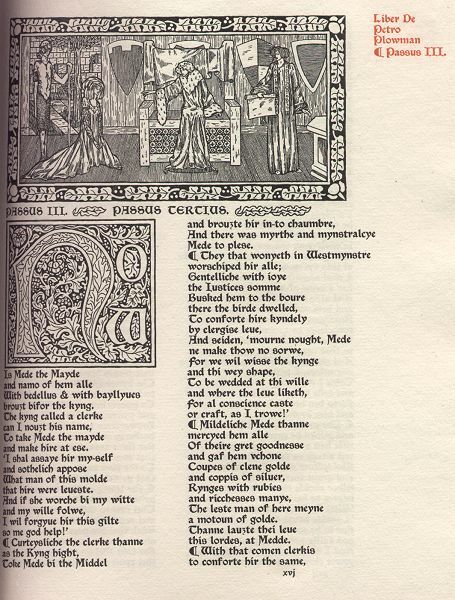 Herbert Johnson (in his book Notes on the Elston Press) states that "...Piers Plowman is the closest to Kelmscott in overall design and feeling, and except for her weak rendering of the human form in her illustations, an excellent book. Her decorative Arts and Crafts borders surrounding the illustrations are superb." Perhaps Mr. Johnson is not a fan of the Arts and Crafts aesthetic. Susan Otis Thompson acknowledges the Arts and Crafts origins of H. M. O'Kane's human figures: "...The Vision of William Concerning Piers the Plowman (1901) is in what Conwell called the Chaucer font, i.e., Satanick. The red shoulder running titles are in Latin and the text in two columns with black paragraph marks. The O'Kane borders and floriated initials are very Morrisian while the illustrations are again reminiscent of Burne-Jones: elongated figures, almost identical faces, back-grounds without white space." Piers Plowman is a Middle English allegorical and satirical poem probably written in the mid-1300s. "The central thought seems to be that the way to truth (and to heaven) lies in honest work and the observance of Christian precepts; the lesson is plain also that if the workers and poor folk are to find any betterment of their lot, they must achieve it by their own industry, good sense, and resolution, for it will not be conferred upon them by the lords, the rich, the exploiters, the lovers of luxury, the lawyers..." (from The New Century Handbook of English Literature). Click on the illustration or chapter initial in the picture above to see larger versions.